Nabisco’s parent company, Mondelez International, has abandoned the workers at its plant on Chicago’s south side, by investing in Mexico and laying off 600 people, all in the name of profit. A new video produced by Front Page with James Earl Jones explains the impact Nabisco’s greed has here at home. Mondelez is feeling the heat for shipping Nabisco jobs to Mexico. 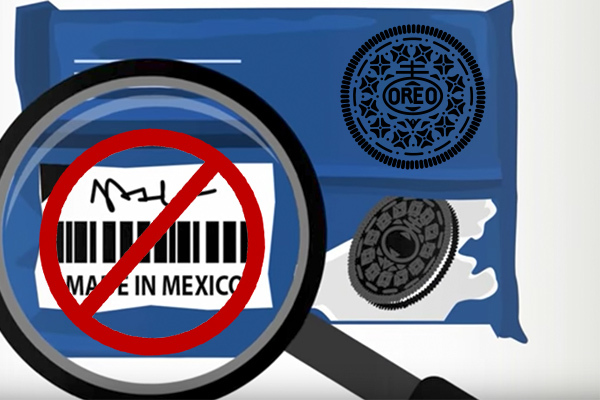 Last month, 17 U.S. senators joined a coalition of AFL-CIO unions, including the IAM, and sent a letter to Modelez CEO Irene Rosenfeld to pressure the corporate giant to reverse its devastating decision to shift Oreo production and jobs to Mexico. Although the move has drawn criticism from workers, unions and politicians around the country, the IAM and the Bakery, Confectionery, Tobacco Workers and Grain Millers International Union (BCTGM) believe consumers will be the key to forcing Nabisco to bring the jobs back. We ask you support the “Check the Label” campaign and refuse to buy Nabisco snacks made in Mexico. By refusing to purchase Nabisco products made in Mexico, consumers are saying no to the slashing of good, middle-class jobs; saying no to business practices that devastate families and communities; and saying no to Nabisco/Mondelēz’s exploitation of workers across borders and oceans.